In the past couple of weeks we’ve been finishing up development on Monsters and Medicine, which is now close to being complete. We’re glad to be finishing up our first project and excited for the ones that lie ahead. Although we have a lot more ideas we wish we could work into the game, as well as some changes we wish we had time to make, there are only so many hours in a year and we have to know where to draw the line. Going forward from Monsters and Medicine we have decided to change the way we approach deciding which game to work on. When we were deciding on our first project to do as a company we started with three weeks of prototyping. During this time we developed around ten prototypes. From these we chose, based mostly on some internal criteria, to develop the game that finally became known as Monsters and Medicine. In retrospect, we have decided that this was not the best way to find the best project for us to work on. Which is why we’re shaking things up for the next round. Going forward we aim to be much more transparent with our prototypes. We’re going to try to put out a new playable prototype every week for the next few months. Our hope is that by making these public and distributing them online, we can find a project that others are as excited about as we are. On that note, we are releasing our first prototype today. 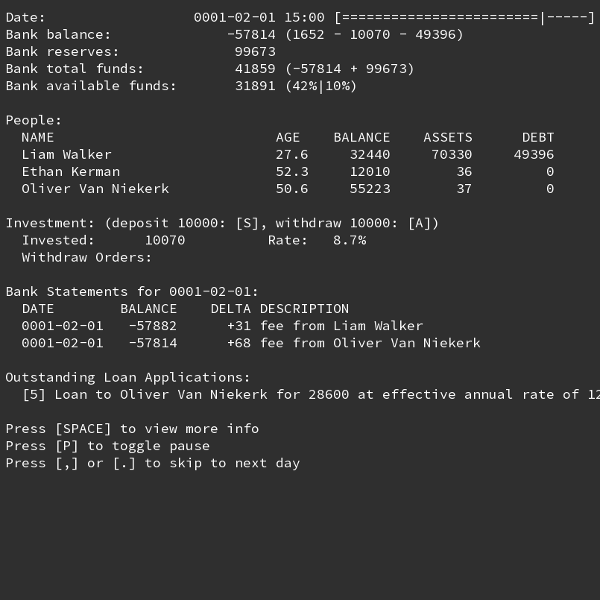 Bacchus Bank is a text-based bank management game. We were playing around with the idea of emergent storytelling and how your actions as a bank (approving/rejecting loans etc.) change the lives of your customers. You can check it out here. Bacchus Bank is a banking management game; manage client loans, acquire new clients, and invest their hard-earned money, while making sure you have enough cash reserves.